License: This product is free, GPL-like applied to hardware project. You are free to build and use it. Keyboard with 102 or 105 keys and more with the set 2 (AT) or the set 3 (PS/2). Since v1.0.7 the keyboard can work without driver and you can build your tables. Mouse up to 5 buttons. Mouse single and double wheel (IntelliMouse). Compatible with ALL Atari computers range (ST, STF, STE, MegaST, MegaSTE, TT and Falcon). Two Atari standard joysticks support DB-9. Motor command for ventilator and temperature sensor. LCD clock and temperature display. Near all IKBD supported (only IKBD_SET_MOUSE_THRESHOLD, IKBD_SET_FIRE_BUTTON_MONITOR, and IKBD_CONTROLLER_EXECUTE are not supported). Updating eiffel capabilities from GEM application EIFFELCF.APP. You can found Eiffel hardware to Satantronic. Add IKBD_LCD command for lot of fun user features. This is an example with LCD.SLB for Aniplayer 2.23 but there are others examples inside the archive. The Eiffel clock can work by interrupts (better precision) but this feature need to reprogram the PIC (eiffel_i.hex, v1.10i). So it's also possible to use the version without interrupts (eiffel.hex). New boot loader in Flash with LCD display. Fix AltGr or Shift state if the AltGr/Shift(s) keys are released before the key. Fix IKBD clock, crash at 0H00 and initialization during power-up. IKBD Power-up code is send. Add LCD display HD44780 compatible on the debug pins RB4 (Data) and RB5 (Clock). 0x7F (SLEEP), 0x80 (POWER), 0x81 (WAKE), 0x8B (WLEFT), 0x8C (WRIGHT), 0x8E (WAPP). Eiffel can work without driver for the sets 2 and 3! or 0xF6 0x05 0x00 0x00 0x00 0x00 0x00 scan-code+0x80 for the break code. It is preferable to use the status frames with EIFFELCF.APP or edit the .inf files for replace the scan-codes 0x54 to 0x5D because this codes was already affected by Atari for the functions keys F11 to F20 (SHIFT F1 to SHIFT F10). Eiffel can send different scan-codes for the same key, there are 3 tables Unshift (the normal Eiffel table stored inside the data EEPROM), Shift and AltGr stored inside the Flash program memory. User tables are in a .inf files and are loaded with EIFFELCF.APP. This new feature works only with the PS/2 set 3. But now it's possible to use Eiffel without driver! By default Eiffel 1.0.7 is compatible with Eiffel 1.0.6. Left Alt key fixed for the set 2, the value is unchanged if you modify the AltGR key with EIFFELCF.APP. EIFFELCF.APP updated for update the firmware. Random problems after Reset normally fixed. Better temperature, now there are 12 points of the CTN's curve. Support of AT set 2 scan-codes. Set 2 or 3 selection inside the GEM application EIFFELCF.APP. Set 2 support POWER, SLEEP, and WAKE keys. Set 2 support Billdoze Multimedia Scan-codes. Near all IKBD commands supported. Mouse wheel up to 5 buttons and Mouse double wheels support. Middle mouse button return now a scan-code. Flash Data PIC programming to change scan-codes returned for Wheels and new buttons 3, 4 and 5. Support of second Flash Data programming to change some extra scan-code returned for keyboard. Eiffel adapter use a powerful Microchip microcomputer, a PIC16F876. Check the microchip web site for a complete description. 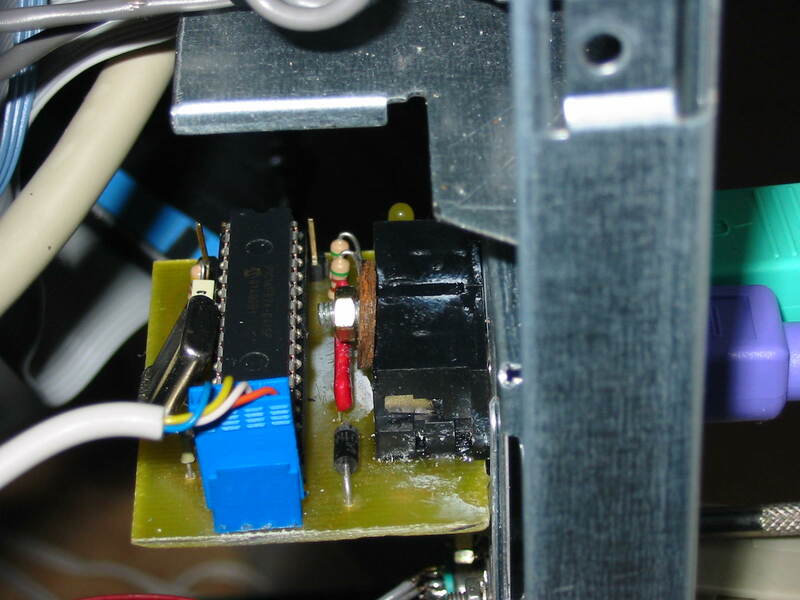 The firmware handle the both keyboard and mouse DIN PS/2 port, convert the synchronous PS/2 communication to the asynchronous protocol for Atari, translate the PS/2 scan-codes to Atari scan-codes, and convert the mouse's frames to a Atari frame. All keys are mapped to Atari scan-codes. The new keys as Win Left, Right, Application, return news scan-codes, not previously used by Atari. The Atari HELP key is mapped to F11 PS/2 keyboard as default. The Atari UNDO key is mapped to F12 PS/2 keyboard as default. The adapter is responsible to switch on and off, the keyboard LED when you press the CAPS LOCK key. The VERR NUM key has no effect and the VERR NUM LED is now a simple power indicator. Since the version 1.0.7, Eiffel not need a keyboard driver to map correctly the keys returned (different scan-codes for the same key). Eiffel can use with differents user tables (.inf) for each country, the characters for normal, shift and alternate mode. The Eiffel interface can handle any mouse. Standard PS/2 with 2 or 3 buttons, enhanced wheel mouse, ie IntelliMouse extensions for wheels and extra buttons, new scan-codes for UP, DOWN, LEFT and RIGHT and buttons 3, 4, 5 are returned. But to get a basic mouse working, no driver is required. Theses scan-codes can be changed with the GEM application EIFFELCF.APP. To program yourself the PIC chip, get the HEX file Eiffel (Intel format). You can use the very good programming software under your Atari: Prog84 / Gputils / Sdcc.